There is a reason why almost every restaurant on the Outer Banks features fresh seafood-Wanchese, on Roanoke Island, is a very busy commercial fishing port. That being the case, there are number of seafood markets carrying the local fisherman’s catch. Here’s a few of them. In Nags Head check out either Daniel’s; Whalebone Seafood Market or Austin’s Seafood Company. Daniels is on the Bypass just a little north of the intersection of US64 and the Bypass. Always very clean in appearance with a good selection. The Daniels family is one of the original Outer Banks settlers. Jimmy Austin started selling seafood about 1960 and back then he was the only one doing it on the Outer Banks. Entering the market, there is no doubt this is a family business. Great selection and a lot of knowledge. Billy’s Seafood is on Colington Road just past the first bridge, so it’s a little bit out of the way, but make the effort. When Guy Fieri was on the Outer Banks, this is where he came for fresh crab. Definitely a seafood store, but a good selection of convenience items as well. Carawan Seafood in Kitty Hawk has been around almost as long as Austin’s. Easy to find, it’s the beat-up looking building in front of the Walmart Shopping Center. Very much a family business, look for a great selection of seafood and a staff who knows what they’re talking about. 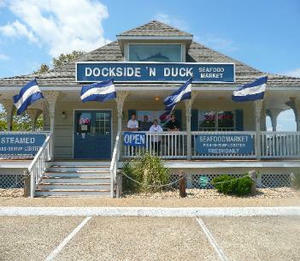 For our guests staying in Duck, check out Dockside n’ Duck Seafood Market. The market is owned by the Newbern family, one of the more prominent farming families in Currituck County-and as it happens, they also have some commercial fishermen in the family tree. Local catch from the family nets supplemented with what is being landed in Wanchese. Green Acres Farm Market which is right by the road is owned by the Newberns and features just picked produce from their farm.